The Turkish baths were a Christmas gift to the people of his hometown from Andrew Carnegie, the American steel magnate and philanthropist. They replaced earlier baths which he had donated, but which were now too small. 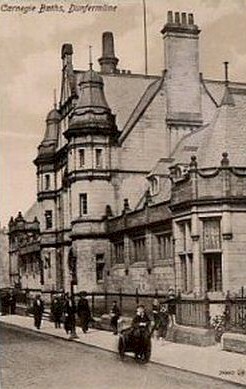 The new baths included a swimming pool and gymnasium, and were built at a cost of around £45,000. Designed by the Edinburgh architect Hippolyte Jean Blanc, the building, in Classical Revival style, is faced in grey stone. The foundation stone was laid on 16 July 1902, and the baths were opened almost three years later on 31 March 1905.